The short-notice auction is the biggest since we were bailed out – and helps build up a cash buffer ahead of fiscal independence. 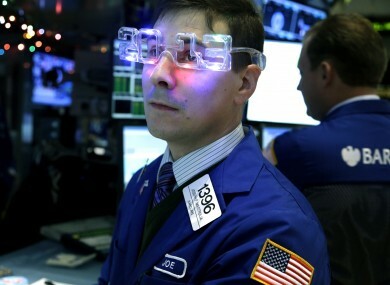 A trader wearing "2013" glasses works on the floor at the New York Stock Exchange . IRELAND HAS RAISED €2.5 billion in a short-notice bond auction, after strong investor demand prompted the body in charge of Ireland’s national debt to sell a greater volume of bonds than had been planned. The National Treasury Management Agency had only yesterday announced its plans to reopen a bond issued last year, maturing in 2017, but had not set a date for when the auction would take place. It had planned to issue a further €2 billion of those bonds, in an attempt to build up a significant cash buffer ahead of Ireland’s planned exit from the EU-IMF bailout programme later this year. However, bidding was opened this morning – with demand for over €7 billion in bonds prompting the NTMA to issue more than it had originally expected. The bonds were sold with a yield – or interest rate – of 3.55 per cent. Ireland is expected to raise about €10 billion in cash reserves before leaving the EU-IMF programme, in order to overcome any momentary difficulties in accessing money from the open market. Today’s auction marks the first time since before the bailout that the NTMA has issued a ‘benchmark’ bond since before Ireland entered its €67.5 billion . Owen Callan of Danske Bank Markets said demand for today’s bond had been “high from the start, with a wide range of international investors involved”. “This, coupled with the fact that the overall bids totalled around EU7bn, is very positive and suggests that Ireland is gradually regaining creditworthiness in the eyes of international investors,” he said. He added that the new bond meant that Ireland was now funded to overcome a “funding cliff” in January 2014, when a series of other government bonds and bills fall due. “Overall it’s a great start to the year for the NTMA,” he said. The cost of borrowing on a 9-year basis – the main benchmark bond currently in issue – fell to 4.4 per cent after the auction, its lowest since December 2009. Email “Ireland raises another €2.5bn at the bond markets”. Feedback on “Ireland raises another €2.5bn at the bond markets”.